Shared Earth Wholesale is delighted to have been picked by Business and Industry Today as one of the top 40 exhibitors at the Autumn Fair at the NEC, Birmingham this year! 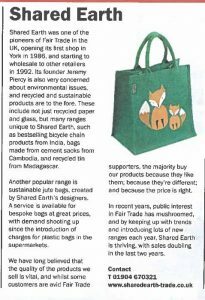 "Shared Earth was one of the pioneers of Fair Trade in the UK, opening its first shop in York in 1986, and starting to wholesale to other retailers in 1992. Its founder Jeremy Piercy is also very concerned about environmental issues, and recycled and sustainable products are to the fore. These include not just recycled paper and glass, but many ranges unique to Shared Earth, such as best selling bicycle chain products from India, bags made from cement sacks from Cambodia, and recycled tin from Madagascar. Another popular range is sustainable jute bags, created by Shared Earth’s designers. A service is available for bespoke bags with demand shooting up since the introduction of charges for plastic bags in the supermarkets. We have long believed that the quality of the products we sell is vital, and whilst some customers are avid Fair Trade supporters, the majority buy our products because they like them; because they’re different; and because the price is right.